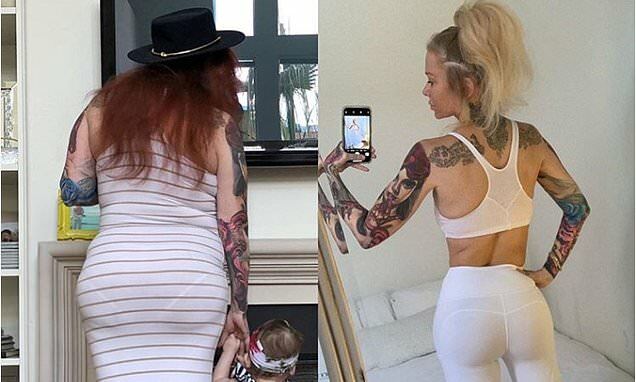 Jenna Jameson has been sharing before and after photos almost weekly since she lost 80lbs last year. And this week was no different as the 44-year-old former adult film star shared a shocking before and after that focused on her derriere. The savvy businesswoman credits her new found Keto diet for helping her shed the weight. In this latest post she looks rounder in a long dress with her child by her side. In the after shot, she is slender in a white workout outfit. Her caption reads, 'I cannot stress enough the importance of taking “before pics” I HATED SEEING THESE PICTURES UNTIL I STARTED SEEING PROGRESS! 'So if you are beginning your journey or even thinking about #keto please take my advice and take jumping off pictures!!! !